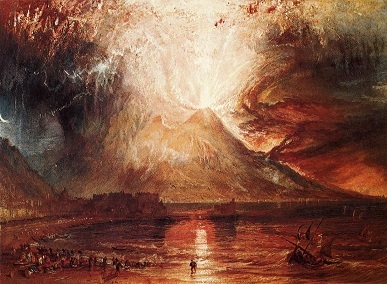 Vesuvius eruption - One of the most famous volcanic eruptions in history, thanks to the record of destruction it left behind and a famous eyewitness account. Mount Vesuvius, the only active volcano on the European mainland, blew up in 79 A.D. with devastating effect. It destroyed the Roman towns of Pompeii, Herculaneum, Stabiae and Oplonti. The explosion was preceded by several days of earthquakes, but the citizens had grown so accustomed to them, they were largely ignored. When the mountain did blow, the eruption lasted two full days. A geologic survey of the area conducted in modern times determined that the blast was so large, the surrounding region was covered in over nine feet (2.8m) of ash. But that's not what killed the people. A toxic pyroclastic flow of super-heated, heavier than air gas rolled down the mountain, and both burned and suffocated everything alive. At the same time, huge boulders and rocks were flung from the the power of the blast and did terrible damage as well. The ash that followed fell for several days and created a permanent tomb for the victims. An estimated 16,000 people died. The tragedy was little more than a footnote for a millennium and a half until the letters of Pliny the Younger were discovered in the 16th century. Concerning the Vesuvius eruption, he wrote two letters to the historian, Tacitus (below). At the time of the blast, Pliny was a young man of 18 staying with his uncle, Pliny the Elder (to distinguish the two). Both witnessed the events unfolding from the town of Misenum across the Bay of Naples about 22 miles (35km) away. The Elder was a naval commander in charge of the Roman fleet at Misenum. He launched a rescue effort by sea, but died in the attempt. Then in 1748, the towns of Pompeii and Herculaneum were unearthed and excavation on them began. They revealed in graphic detail the horrific deaths the residents suffered at the time of the explosion.